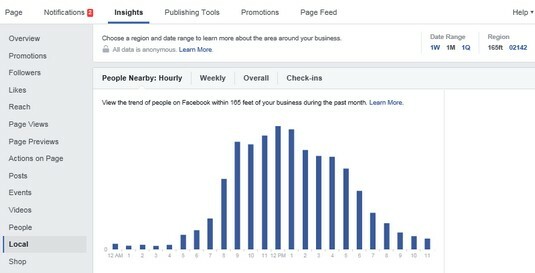 The Local report on Facebook shows you the activity going on around your business location. You can see peak hours of action, demographic info, and Ad performance as it relates to people who are near your physical location. The Local report shows you people around your business location. Next, you see a breakdown of age and gender for the people nearby. You also see the hours of the day and the day of the week when activity near your location is highest. This helps you determine what hours your store or service business should be open for business. 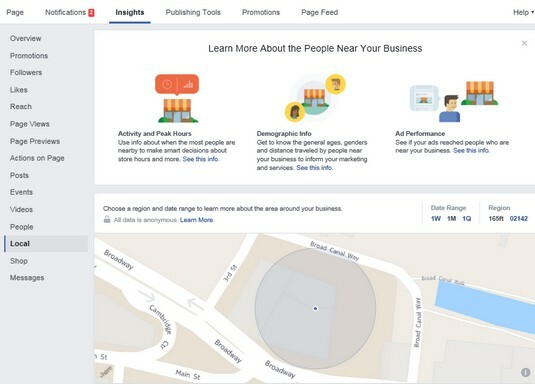 The Ad performance graph displays the percentage of people who saw your ad on Facebook who were within 165 feet of your business in relation to your ad spending. This shows you which days were high-performing days. The People Nearby graph shows you data concerning people within 165 feet of your location hourly (for a 24-hour period), weekly (days of the week for one week), overall (trend data that shows you people nearby in relation to people nearby who saw your ads) and by check-ins (the number of people who checked into your business). The People Nearby graph shows you trend data for several time and date ranges.